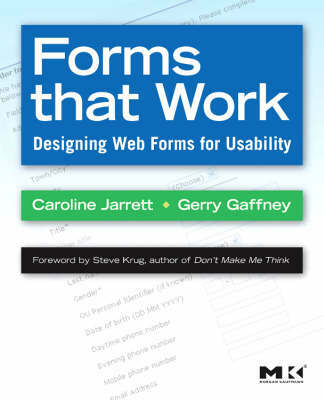 Forms that Work is a book on how to design web forms properly. Some time ago I reviewed a similar book, Web Form Design by Luke Wroblewski, which deals with the same subject. I then thought that this was a very narrow scope for a book, but perhaps it was not since this book was published shortly after. No doubt web forms are all around us, so the need for knowledge and skill to design them well should be great. I certainly can’t seem to get enough of these books. One thing that’s great about this book is that it not only focuses on how to visually design forms but more so on why people should bother to fill them out in the first place. That’s a pretty important question to ask, and one that can have a dramatic impact on the success of your form. The authors introduces the concept of the three layers of the form. The book is organized around these three layers, so each layer has it’s own part. The first layer is about the relationship between the organization behind the form and the user. The second layer is about conversation. That is how the form talks to the user with it’s questions, labels and instructions. It’s also about how to logically group different kinds of information. I think that this way of organizing the book works very well. It supports the design process presented and gives you a good understanding of what to focus on. I found Forms that Work fun and easy to read. It’s filled with illustrations and real-life examples, which makes it easy to understand how to put the concepts into practice. What I love about this book is that it’s compact and succinct. The authors deliberately decided to keep the book under 200 pages which I think was a very wise decision. The nitpicks I have is that I found quite a few typos. I also sometimes felt that the illustrations didn’t quite had the quality that I’d expect from a book like this. That said, these are only minor complaints and ones that shouldn’t prevent you from reading this otherwise excellent book. This book will give you tips and guidelines that gets you started right away creating better web forms. The authors back their advice up with years of designing and usability testing forms, so you can feel pretty confident that they deliver good advice. 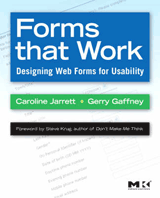 There’s no doubt that after reading this book you will be able to design better forms. I highly recommend it. Thanks for reviewing our book. I’m very pleased that you recommend it. On the subject of the typos: just shows that no matter how hard I tried, a few still managed to creep through. please let me know what errors you found. I’ll create an ‘errata’ page that lists them. On the subject of the illustrations: it’s a tough one. We found that one of the hardest parts of writing the book was finding appropriate illustrations. On the one hand, it’s not difficult to find forms that have all sorts of problems in them (that’s why we wrote the book). On the other hand, it can be surprising hard to find an example that just has a specific type of problem and isn’t full of loads of other distracting errors. Was your problem with all of the illustrations, or just specific ones? There are 226 altogether. We’re really pleased that you liked the organisation of the book around the three-layer model. Over the years, I’ve found that the three layers really help me to think about the different issues in forms design so it’s great that it worked for you. Caroline: Well typos do have a tendency to creep into my texts too! 🙂 Thanks for the heads up! I wish I had noted the typos as I was reading your book, but unfortunately I didn’t. But if I find any while browsing it (which I probably will, building my next web form) I’ll be happy to contribute to your errata page. My problem wasn’t with all illustrations. The screen shots were fine and the comics as well, it was some others that to me looked a bit unpolished. I think the three-layers model works beautifully, great job! I keep listening to the news speak about getting free on-line grant applications so I have been looking around for the best site to get one.